(b) Disability benefits.–Sixty percent of any loss of gross income and loss of earning capacity per individual from inability to work proximately caused by the injury sustained by the injured person, plus all expenses reasonably incurred in obtaining from others ordinary and necessary services in lieu of those that, but for the injury, the injured person would have performed without income for the benefit of his or her household. All disability benefits payable under this provision must be paid at least every 2 weeks. (c) Death benefits.–Death benefits of $5,000 per individual. Death benefits are in addition to the medical and disability benefits provided under the insurance policy. The insurer may pay death benefits to the executor or administrator of the deceased, to any of the deceased’s relatives by blood, legal adoption, or marriage, or to any person appearing to the insurer to be equitably entitled to such benefits. (3) INSURED’S RIGHTS TO RECOVERY OF SPECIAL DAMAGES IN TORT CLAIMS.–No insurer shall have a lien on any recovery in tort by judgment, settlement, or otherwise for personal injury protection benefits, whether suit has been filed or settlement has been reached without suit. An injured party who is entitled to bring suit under the provisions of ss. 627.730–627.7405, or his or her legal representative, shall have no right to recover any damages for which personal injury protection benefits are paid or payable. The plaintiff may prove all of his or her special damages notwithstanding this limitation, but if special damages are introduced in evidence, the trier of facts, whether judge or jury, shall not award damages for personal injury protection benefits paid or payable. In all cases in which a jury is required to fix damages, the court shall instruct the jury that the plaintiff shall not recover such special damages for personal injury protection benefits paid or payable. (4) PAYMENT OF BENEFITS.–Benefits due from an insurer under ss. 627.730–627.7405 are primary, except that benefits received under any workers’ compensation law must be credited against the benefits provided by subsection (1) and are due and payable as loss accrues upon receipt of reasonable proof of such loss and the amount of expenses and loss incurred which are covered by the policy issued under ss. 627.730–627.7405. If the Agency for Health Care Administration provides, pays, or becomes liable for medical assistance under the Medicaid program related to injury, sickness, disease, or death arising out of the ownership, maintenance, or use of a motor vehicle, the benefits under ss. 627.730–627.7405 are subject to the Medicaid program. However, within 30 days after receiving notice that the Medicaid program paid such benefits, the insurer shall repay the full amount of the benefits to the Medicaid program. (a) An insurer may require written notice to be given as soon as practicable after an accident involving a motor vehicle with respect to which the policy affords the security required by ss. 627.730–627.7405. 3. Accidental bodily injury sustained by a relative of the owner residing in the same household, under the circumstances described in subparagraph 1. or subparagraph 2., if the relative at the time of the accident is domiciled in the owner’s household and is not the owner of a motor vehicle with respect to which security is required under ss. 627.730–627.7405. (a) If a request is made by an insurer providing personal injury protection benefits under ss. 627.730–627.7405 against whom a claim has been made, an employer must furnish, in a form approved by the office, a sworn statement of the earnings, since the time of the bodily injury and for a reasonable period before the injury, of the person upon whose injury the claim is based. (g) An insured seeking benefits under ss. 627.730-627.7405, including an omnibus insured, must comply with the terms of the policy, which include, but are not limited to, submitting to an examination under oath. The scope of questioning during the examination under oath is limited to relevant information or information that could reasonably be expected to lead to relevant information. Compliance with this paragraph is a condition precedent to receiving benefits. An insurer that, as a general business practice as determined by the office, requests an examination under oath of an insured or an omnibus insured without a reasonable basis is subject to s. 626.9541. Upon request by either party, a judge must make written findings, substantiated by evidence presented at trial or any hearings associated therewith, that any award of attorney fees complies with this subsection. 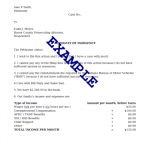 Notwithstanding s. 627.428, attorney fees recovered under ss. 627.730–627.7405 must be calculated without regard to a contingency risk multiplier. (9) PREFERRED PROVIDERS.–An insurer may negotiate and contract with preferred providers for the benefits described in this section, which include health care providers licensed under chapter 458, chapter 459, chapter 460, chapter 461, or chapter 463. The insurer may provide an option to an insured to use a preferred provider at the time of purchasing the policy for personal injury protection benefits, if the requirements of this subsection are met. If the insured elects to use a provider who is not a preferred provider, whether the insured purchased a preferred provider policy or a nonpreferred provider policy, the medical benefits provided by the insurer shall be as required by this section. If the insured elects to use a provider who is a preferred provider, the insurer may pay medical benefits in excess of the benefits required by this section and may waive or lower the amount of any deductible that applies to such medical benefits. If the insurer offers a preferred provider policy to a policyholder or applicant, it must also offer a nonpreferred provider policy. The insurer shall provide each insured with a current roster of preferred providers in the county in which the insured resides at the time of purchase of such policy, and shall make such list available for public inspection during regular business hours at the insurer’s principal office within the state. (12) CIVIL ACTION FOR INSURANCE FRAUD.–An insurer shall have a cause of action against any person convicted of, or who, regardless of adjudication of guilt, pleads guilty or nolo contendere to insurance fraud under s. 817.234, patient brokering under s. 817.505, or kickbacks under s. 456.054, associated with a claim for personal injury protection benefits in accordance with this section. An insurer prevailing in an action brought under this subsection may recover compensatory, consequential, and punitive damages subject to the requirements and limitations of part II of chapter 768, and attorney’s fees and costs incurred in litigating a cause of action against any person convicted of, or who, regardless of adjudication of guilt, pleads guilty or nolo contendere to insurance fraud under s. 817.234, patient brokering under s. 817.505, or kickbacks under s. 456.054, associated with a claim for personal injury protection benefits in accordance with this section. (13) MINIMUM BENEFIT COVERAGE.–If the Financial Services Commission determines that the cost savings under personal injury protection insurance benefits paid by insurers have been realized due to the provisions of this act, prior legislative reforms, or other factors, the commission may increase the minimum $10,000 benefit coverage requirement. In establishing the amount of such increase, the commission must determine that the additional premium for such coverage is approximately equal to the premium cost savings that have been realized for the personal injury protection coverage with limits of $10,000. (15) ALL CLAIMS BROUGHT IN A SINGLE ACTION.–In any civil action to recover personal injury protection benefits brought by a claimant pursuant to this section against an insurer, all claims related to the same health care provider for the same injured person shall be brought in one action, unless good cause is shown why such claims should be brought separately. If the court determines that a civil action is filed for a claim that should have been brought in a prior civil action, the court may not award attorney’s fees to the claimant. (16) SECURE ELECTRONIC DATA TRANSFER.–A notice, documentation, transmission, or communication of any kind required or authorized under ss. 627.730–627.7405 may be transmitted electronically if it is transmitted by secure electronic data transfer that is consistent with state and federal privacy and security laws. (17) NONREIMBURSABLE CLAIMS.–Claims generated as a result of activities that are unlawful pursuant to s. 817.505 are not reimbursable under the Florida Motor Vehicle No-Fault Law.